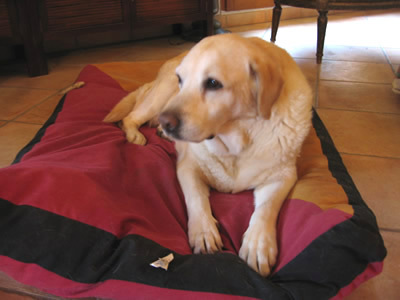 Flavia was a yellow labrador who came to stay at Pension Milou when she was 10 years old. 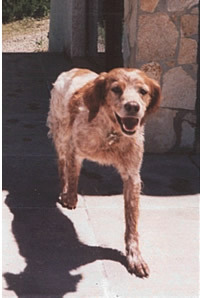 Flavia had been trained as a Guide Dog for the Blind and had lived happily guiding her owner until she was 6 and half years old when sadly her owner died. She was returned to the Guide Dog School where she was found a happy home in Nice with a fireman and his wife and where she lived until she was 9 and half years old. By then, she'd become exceedingly fat. 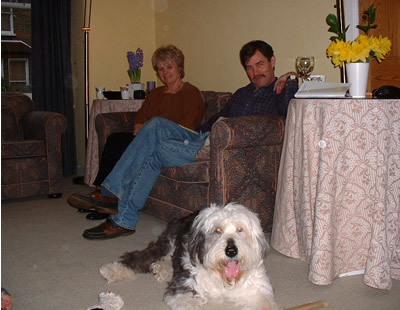 Unfortunately the couple divorced and once again Flavia was sent back to the Guide Dog School. She was then found a new home with a older lady but it really wasn't suitable. Fortunately a family member realised there was a problem and I was recommended to her by a veterinary surgeon. When Flavia was brought to me, she waddled down the track weighing in at over 50 kilos and with an extremely nasty eye infection which hadn't been responding to treatment. I was asked to look after her for six months, get weight off her, get her bad eye tended to and then the family member would try and find her a new home. Eventually Flavia went to Dr. Gaiddon, the dog eye specialist in Cannes, who actually saved her eye and for the rest of her life she had three different drops in that eye, twice a day. After about six weeks, I realised Flavia wouldn't be going anywhere - she'd stolen my heart - I asked the lady who'd brought her to me if she'd be happy at my adopting her and that is what happened. I shall always appreciate the kindness of this lady, the family member, who brought me several enormous sacks of diet dog food over those first few months. Flavia eventually reached a trim 32 kilos and lived till she was 15 although in the last year she started to suffer badly with arthritis - hardly surprising considering how fat she had once been. 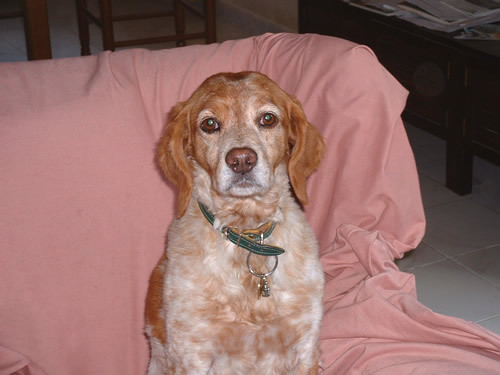 We managed with medication for a while and eventually she was put to sleep in 2006, one year after Milou. She was a wonderful dog, patient, kind. I learned a lot from sweet Flavia.